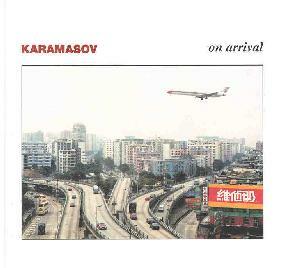 Karamasov is an interesting hybrid of Canterbury-style progrock and Krautrock, though I shouldn't be too surprised as the quartet appears to be half-English (keyboardist Adam Stewart and bassist Harry Rambaut) and half-German (guitarist Johannes von Weizsacker and drummer Berit Immig). "On Arrival" contains 10 short tunes totaling a mere 34 minutes, a far cry from the usual progrock modus operandi. All of the tracks but one (featuring only a single lyric line itself) are pure instrumentals, and range from more basic repetitive rhythms to music that is quite complex. From the very outset, the tinny snare sounds and syncopated drumming of Immig reminds me of Can's Jaki Leibezeit... and it works well here just as it did on "Tago Mago" over 25 years ago. Naturally, I found myself wanting to compare every other aspect of Karamasov's music to Can. "8 Beef Critter" is a touch dancier tune than classic Can, with a funky rhythm that is adorned with bluesy keyboard runs. "Fengan Nemo" is truly the cat's meow though... cool, cosmic, rhythmic bliss, with a bassline that is far more active than Holger Czukay's normal mode of operation. "Don't you know the sun always shines in space" is the lone lyric line I was telling you about (in the track of similar name), and is echoed over and over against a danceable, choppy beat. Thrown in are generous servings of synthetic bleeping and gurgling and a touch of roller-rink organ. Great stuff. But there are also a couple weak spots. "Morgenmuffel" is the type of 'wanker' prog that leaves me cold...and here it's muted in a way that makes for a dull experience. On the other side, "Roadsnack" is just too techno for my tastes even though it tries hard to be fully orchestrated as opposed to pure beat. With some reservations, I recommend Karamasov to those who like adventurous music, whether it be in the form of progrock, space rock, or dance music. The beats and rhythms are accessible, and thankfully they manage to keep the music from becoming too cutesy. But some work, and some don't. And at only 34 minutes, you might think twice about paying an import price if that's what it takes.